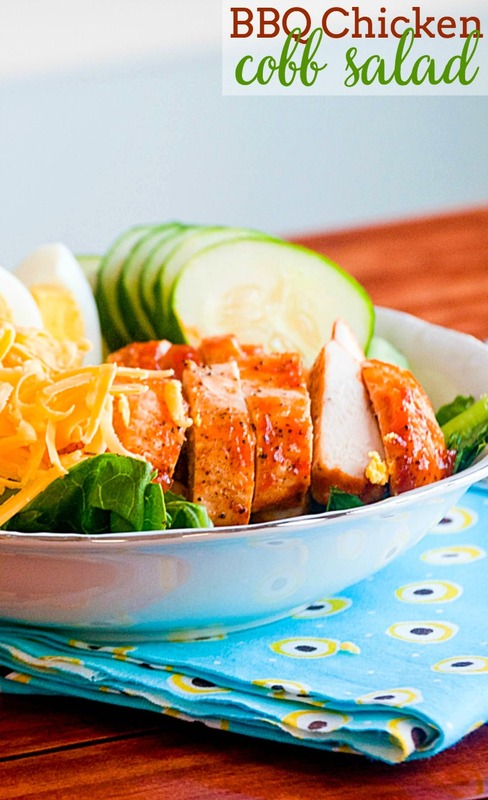 This BBQ chicken cobb salad is one for the ages – traditional ingredients with a new spin. Hi! Kim here from Feed Me, Seymour! When I was a kid, we didn’t often eat salads. I think my mom would have enjoyed it more if we did, but this gal here was not big on leafy greens and grains. When you break it down, I am more of a meat and potatoes person than fruits and veggies. No meal is complete without a meaty protein and at least two different sides. It took me a long time to come around to salads as filling meal options. When I thought of salads, I pictured the salad bar at Wendy’s. Some wilted iceberg lettuce, a few tomatoes, a cucumber and a blob of fatty dressing sloshed across the top was the only salad I knew. And when laid out on paper, that sounds completely unappealing. It wasn’t until later that I realized you could turn most anything into a delicious salad. Leftover taco fixings on top of some romaine can be dressed with a great avocado ranch dressing. And grains like couscous make any salad more hearty and filling. The key to satisfying and filling salads is to get creative and fill them with ingredients you actually like and enjoy. 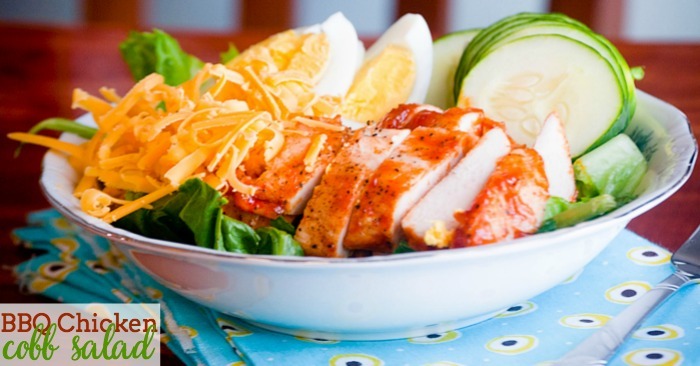 Hence the ultimate reason for this BBQ chicken cobb salad. A few weeks ago, I made an Angry Orchard BBQ sauce to go on top of some BBQ chicken we’d planned on for dinner. The recipe for the sauce itself was an experiment I wasn’t sure would play out, but consider me happy with it because we’ve been slathering it on top of everything ever since. It is most definitely my new go-to summer sauce. As for the salad itself, well how could I not incorporate my favorite sauce into it? It was like divine inspiration. Preheat the oven to 375 and line a baking sheet with foil. Place the chicken on the sheet and slather with half the BBQ sauce. Bake 10 minutes. Flip the chicken and slather with the other half of the BBQ sauce. Cook 10 more minutes until cooked through. Allow the chicken to cool then slice. Divide the lettuce between two bowls. 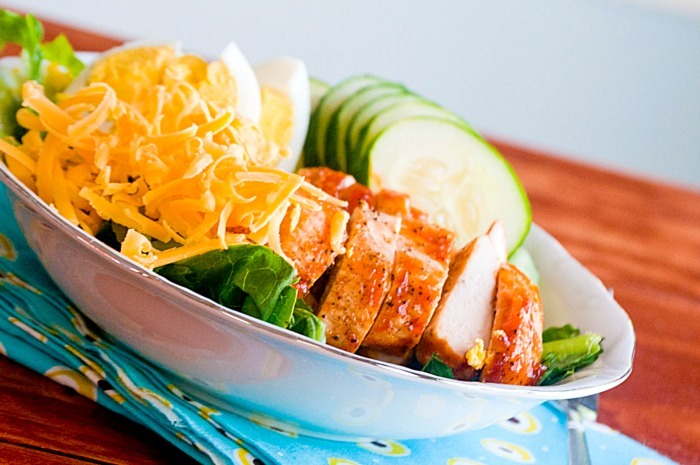 Place a few cucumber slices onto each, followed by the egg and the cheese. Top with chicken. A word on dressings: I left this salad naked, which may seem like an oversight. It’s not, I promise. Dressings are almost as subjective as salads themselves, with each person liking or hating different dressings and toppings. For me, I went with a little drizzle of honey mustard but an avocado ranch mixture works great as does some French dressing. Ultimately, it is your choice with the dressing. Whatever you choose, make sure it tastes great!